Looking ahead to an evening of celebration at the annual Down GAA County Dinner taking place in the Canal Court Hotel, Newry tomorrow (Friday 2nd November). The evening will bring together players from all clubs and codes right across the Mourne County to mark another successful season for Down GAA. An awards presentation will take place after the dinner where guests will find out who has been voted the Ulster Bank Down GAA Player of the Championship, which will be presented by Ulster Bank’s Regional Director, Mark Crimmins. 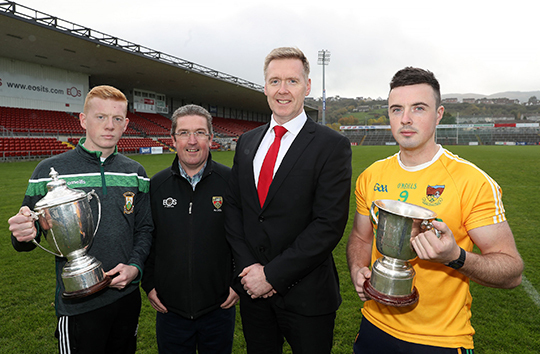 (l-r) rising Burren star, Ronan McGrath; Down County Chairperson, Sean Rooney; Mark Crimmins, Ulster Bank and Clonduff Hurling Captain, Sean Downey.